Affordable Dental Care, Even Without Insurance! We believe that not having dental insurance shouldn’t prevent anyone from receiving the high-quality dental care that they need and deserve. Therefore, we’ve created the Smile Club to help make treatment more affordable for all of our patients! Membership in the Smile Club is only $399 per year (for a limited time; regularly priced at $599), and includes two basic dental cleanings, two comprehensive exams, and all necessary X-rays! As a memeber, you’ll also receive a 20% discount on additional services you may need, including cosmetic smile improvement, restorative dental treatment, and prosthetic tooth replacement. Our mission is to make high-quality dental care affordable for everyone, especially for those without dental insurance. 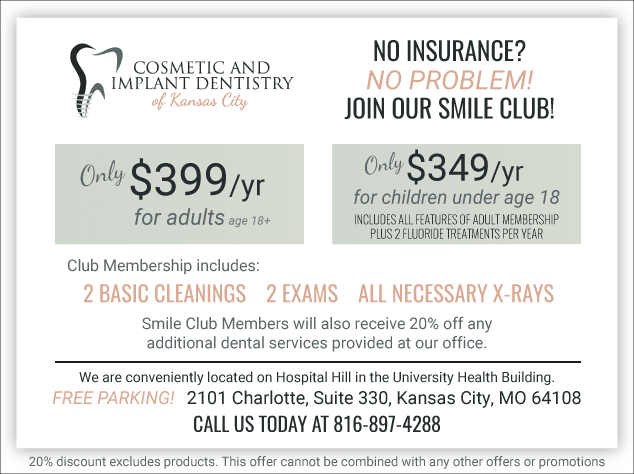 With membership in our Smile Club, you can enjoy significant discounts on essential dental treatments and services. To sign up, or to learn more about our Smile Club benefits, schedule a consultation by calling Cosmetic & Implant Dentistry of Kansas City, today at 816-897-4288.